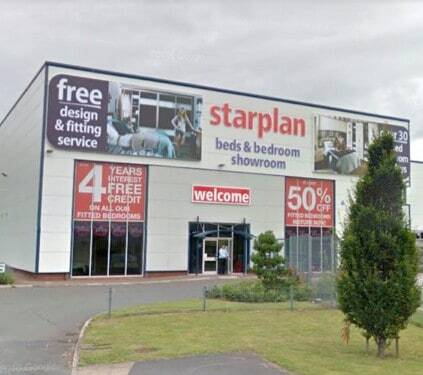 Starplan welcomes you to our Fitted Bedroom Showroom Warrington! Our newly refurbished bedroom showroom is the perfect destination to start the journey to your new made to measure bedrooms. As a company, Starplan Bedrooms have over 40 years of experience in within the furniture industry. This experience has allowed us to create and offer luxury fitted bedroom furniture with an affordable price tag. The thought of creating a room from nothing seems like a nightmare for many, but we are fully equipped to make that nightmare into a dream. Our brilliant bedroom design team are fully trained and will be available every step of the way to advise. As a result, we will help create perfect fitted bedrooms. All you need is some room measurements and your ideas! On the other hand, you can book a free design visit from the comfort of your own home. Let us do all the work and create the perfect fitted bedroom design for you! Address: Next To Gemini Retail Park, Charon Way, Westbrook, Warrington, WA5 7YD. 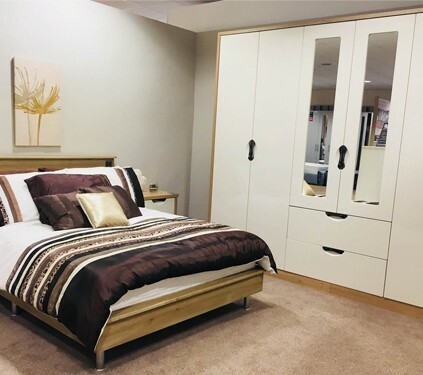 Our refurbished Warrington bedroom showroom is complete with over 40 different bedroom displays. We have fitted bedrooms in traditional and modern styles as well as freestanding furniture and office sets. It’s the ideal place to get some inspiration flowing. All of our high-quality bedroom furniture comes with free delivery and installation. We want to make it as easy as possible for you to have the best bedroom you can. Which is why all of our fitted bedrooms Warrington come with a 10-year guarantee and all free standing furniture has a 5-year guarantee. After all, we want you to be ready for anything life throws at you and your home. Fitted Bedroom Design, Deliver, Install! 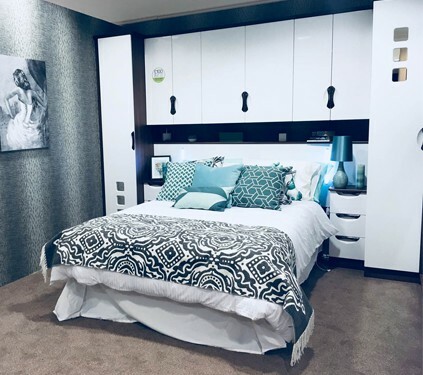 Our Fitted Bedroom Showroom Warrington is open 7 days a week and is always full of warm and helpful staff ready to help with bedroom based questions. We are based next to Gemini Retail Park. It’s just off Charon Road which is close to Junction 8 of the M62. Free parking is available right in front of our bedroom showroom to make your journey to us even smoother.